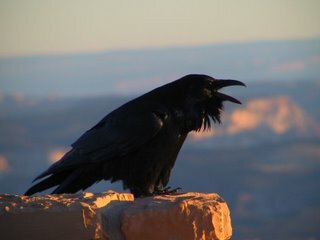 Crows and ravens are part of the family Corvidae. 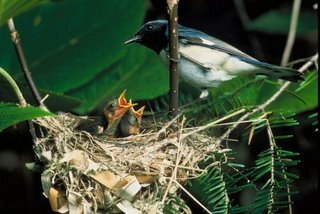 In North America, this family also includes jays and magpies in addition to its larger, darker members. Despite the familiar fable, members of this family are among the most intelligent of birds. They are known to use strategems to acquire food; jays, for example, will lure smaller songbirds away from their nests with imitations of hawk calls. Some studies suggest intelligence on the level of great apes. Crow intelligence is the reason that attempts to scare these birds from farms and gardens rarely work for long. Unfortunately, our local crow population have been hit hard by the outbreak of West Nile Virus. 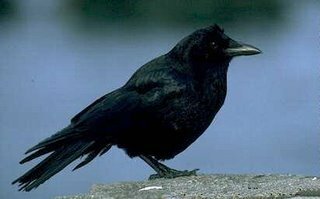 American Crows seem to be particularly susceptible, but corvids as a group suffer a higher death rate when exposed to the virus. 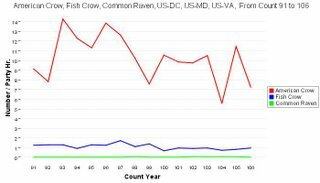 The graph below, derived from Christmas Bird Count results in the DC area, gives a sense of their decline in the past decade. 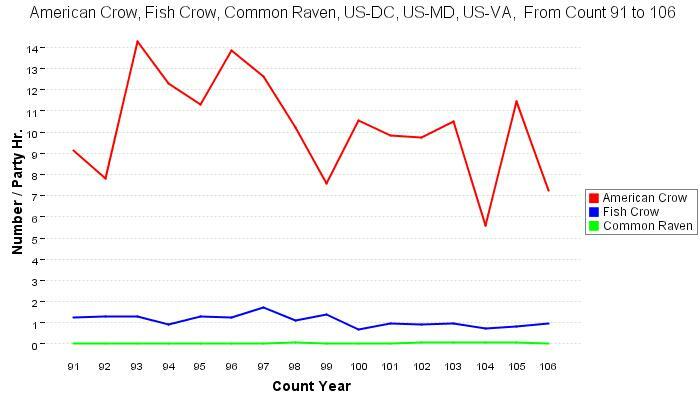 Because of recent worries about West Nile Virus and highly-pathogenic poultry flu in humans, crows again are becoming ominous signs. Only now, it is the dead crows rather than the living ones that are a cause for worry. With both diseases, birds are under a greater threat than humans. Note: Audubon at Home has some good suggestions for making Halloween less wasteful. Crossposted at Blue Ridge Gazette. I came across the following photograph recently (via Birderblog). This golden-crowned kinglet is caught in a burdock plant. Burdock is an invasive species from Europe. 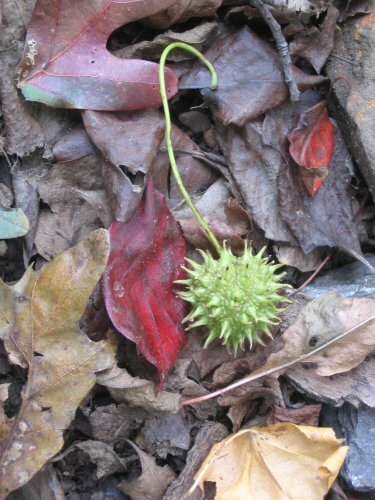 It disperses its seeds via round seed balls with hooked spikes. These hooked spikes latch onto passing animals for distribution. For larger animals, these seed heads are a relatively harmless annoyance. 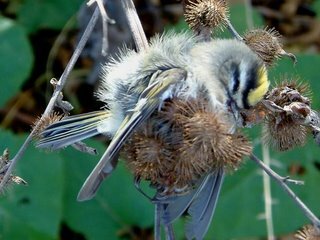 For small birds, they pose a hazard, and may be life-threatening. The photo above was taken by John Idzikowski; see his site for the complete story behind the photograph. For more on burdock, see here and here. During the past six years, many of us have suspected that the Bush administration was dragging its heals when it came to protecting endangered species. Despite the show of support for the ivory-billed woodpecker, in most cases administration officials declined to act on requests for protection under the Endangered Species Act, especially where such protection would conflict with the interests of powerful donors. We thought that this was another case of ideology impeding reality-based policy. Now, thanks to the Freedom of Information Act, there is some documentation for this suspicion. Julie MacDonald, the deputy assistant secretary of the interior for fish and wildlife and parks, has blocked requests from scientists on the interior staff to protect species such as the Gunnison Sage Grouse. In many cases she criticized their reports for not taking sufficient account of complaints by land owners and others who wanted to use public lands that were needed by the declining species. "A lot of times when I first read a document I think, 'This is a joke, this is just not right.' So I'll ask questions,' " said MacDonald, a civil engineer by training who worked at the California Resources Agency before joining the Interior Department in 2002. "These documents have tremendous economic and social implications for people." The result is that the Bush administration has designated far fewer species under the Endangered Species Act than the two previous administrations: about 10 per year, compared to 64 per year under Clinton and 59 per year under the first Bush. The decline has certainly not been because of a lack of species to consider. The Red Knot, for example, has suffered a catastrophic decline in the past decade and yet has been unable to make the list. Instead, as the linked article makes clear, political appointees at the top are exhibiting undue deference to industry. 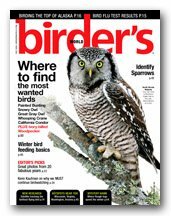 The magazine Birder's World is celebrating its 20th anniversary, and its editors have redesigned the layout in honor of the celebration. Since I am new to Birder's World, I cannot compare the new design to the old one. However, it is clean and attractive, and information is easy to find. The regular features are all present - reader questions, birding news, columns on bird identification and biology, and book reviews. The Northern Hawk Owl on the cover commands attention. 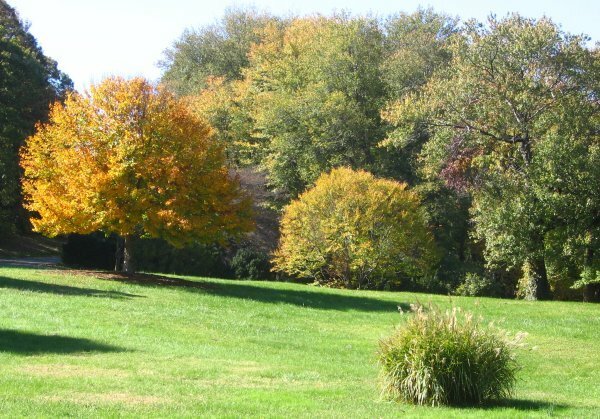 One feature, "Hotspots Near You," which highlights small county and state parks in urban areas, included a D.C.-area site, Huntley Meadows. Others have picked nits with other aspects of the list. It is not the list I would have created, but I would love to see all of the birds listed there. The first species seemed the most out of place to me. For all but a tiny group of researchers, the ivory-billed woodpecker that leads the list is largely hypothetical. All other species can definitely be seen, even if with difficulty in some cases. I have seen two of these birds, snowy owl and harlequin duck. Another 20th anniversary feature was a retrospective album of photographs from past issues. It has some great ones, such as a brooding killdeer that appears to have multiple legs and a Thayer's Gull with a sea star hanging out of its bill. 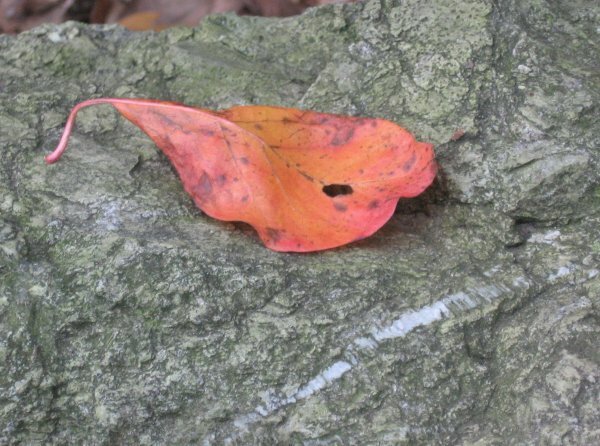 The magazine includes a section of reader-submitted photographs in each issue. Some of these are quite striking as well, especially one of a turkey in flight. Overall, the magazine seems geared to an intermediate birding audience. The articles assume some knowledge, such as what "lores" are. In contrast to the American Birding Association's Birding, however, Birder's World deals with problems that are more likely to face the average birder. Birding sometimes seems more suited to people who travel constantly to remote locations, while Birder's World seems like it could appeal to travelers and non-travelers. The Birder's World website includes a forum for birders. It is fairly modest in membership compared to BirdForum, but seems to have a heavier proportion of North American birders. 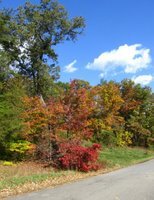 This morning I visited the National Arboretum to see some birds and enjoy the foliage. Several bird species are moving through in large numbers. Ruby-crowned kinglets were all over the Arboretum, in every bush and tree. Hermit thrushes were also plentiful. Several made me think they were other thrush species, but all turned out to be hermit thrushes in the end. Dark-eyed juncos are also back in large numbers; today I saw my first of the fall. I was surprised to see a blue-headed vireo lingering in the Azalea Garden; I thought I had missed this species for the fall. I was also surprised to see two fox sparrows. (Usually I do not see fox sparrows until later in the fall.) These two birds let me watch for a long time as they thrashed about in the open. 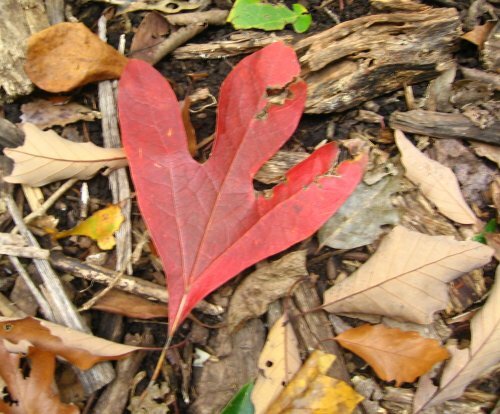 Like white-throated sparrows, fox sparrows noisily kick leaves behind them as they forage. The meadows around the columns were very productive this morning. As I walked through them, a merlin whizzed overhead. It was followed by a sharp-shinned hawk, which turned several circles over the field before moving on. 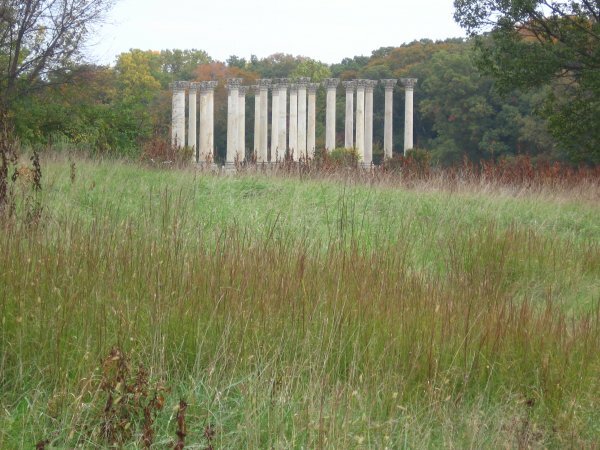 The Arboretum is replanting grass in a large section next to the columns. The bare ground here was being worked by palm warblers and eastern phoebes. Together the two species made for a flurry of tail-pumping. Just before I left, I saw a very large flock of chipping sparrows just inside the treeline in the patch of woods near the bonsai display. There were about 50-60 of them in total - one of the larger chipping sparrow flocks that I have seen at the Arboretum. They forage in the grass and then duck back into the woods for cover. Today was another beautiful day to be out, thanks to a string of good weather. Last week I thought that fall migration was winding down, but it looks like it still has some surprises left. The garden at the National Museum of the American Indian continues to turn up some good-for-downtown birds. 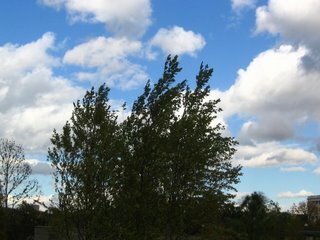 This afternoon the bushes along 3rd Street SW were full of birds hopping and flying back and forth. There were loads of ruby-crowned kinglets, at least one hermit thrush, a first-fall male common yellowthroat, and plenty of white-throated sparrows. All of these were at very close range; all were within ten feet and many were within five feet of me. The rest of this post consists of photographs from this afternoon on the Mall. 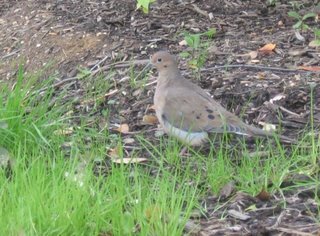 Two birds from the Indian Museum gardens: a mourning dove and a speedy kinglet. 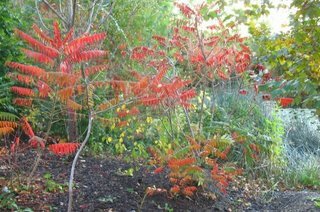 The last two photographs are from the new garden adjacent to the U.S. Botantical Garden conservatory. Here is a video of a pelican trying to swallow a pigeon whole. I am not sure if this is the same incident mentioned earlier in the week. It is still amazing that it could swallow something that big. If the video above does not load, you can see it here. Posts from the past week. News and links about birds, birding, and the environment. Palaeontologists have discovered a new species of "terror bird." This South American species was about ten feet tall with a 18-inch bill that could handle dog-sized prey. It lived about 15 million years ago. The Maryland State Law Library's collection of original prints by John James Audubon is undergoing restoration. Aside from the usual build-up of grease and discolortion, several prints have been creased or cut, so that the restoration work is more difficult. 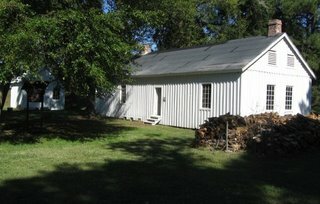 The linked article describes the restoration process. Cornell has developed new software called "Raven" for analyzing sound recordings. Users can edit files and view spectrograms. Several versions for professionals cost money, but there is also a free version for hobbyists. See here for details. The Independent has a list of ten recommendations for helping garden birds. It is directed for a British audience but the same holds true here. Rabbits are stripping the vegetation from Macquarie Island and destroying important habitat for albatrosses and penguins. These rabbits are the descendents of animals brought by Europeans in the 19th century. On January 20, 2007, there will be a conference for science bloggers at the University of North Carolina in Chapel Hill. See here for more information about the program and registration. For people in or near College Park, Maryland: The Fluid Dynamics Reviews Seminars of the Burgers Program presents G.R. Spedding (University of Southern California Aerospace and Mechanical Engineering Department) who will discuss “Experiments in Low-Speed Aerodynamics: Birds and Other Micro-Air Vehicles." Time: Noon on Friday, October 27. Place: Room 2164, Glenn L. Martin Hall, University of Maryland College Park Campus, College Park, MD. The 35th I and the Bird was posted online this morning at Migrations. Every two weeks, I and the Bird celebrates the best of bird-related blogging from around the internet. Mr McNaughton, from the Press Association, said: "The pelican was on the towpath preening itself, and there were a lot of tourists watching it. "Then the bird got up and strolled along until it reached one of the pigeons, which it just grabbed in its beak. "There was a bit of a struggle for about 20 minutes, with all these people watching. The pelican only opened its mouth a couple of times. "Then it managed to get the pigeon to go head first down its throat. It was kicking and flapping the whole way down." 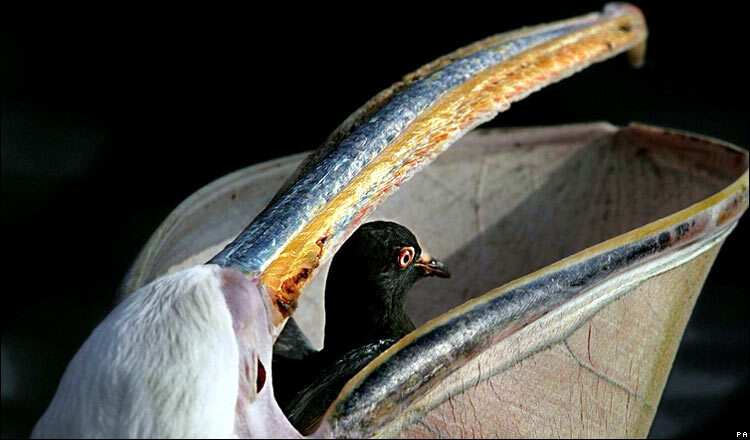 Pelicans normally eat strictly fish, but when pigeons are an easy meal, there is less need to be discriminating. That is a great picture. Over the past month, ring-billed gulls have been returning to their usual winter haunts around downtown Washington. This morning I got to look at at mix of adult and sub-adult gulls around the reflecting pool in front of the Capitol. They are not quite up to their peak winter numbers yet, but they will be soon. 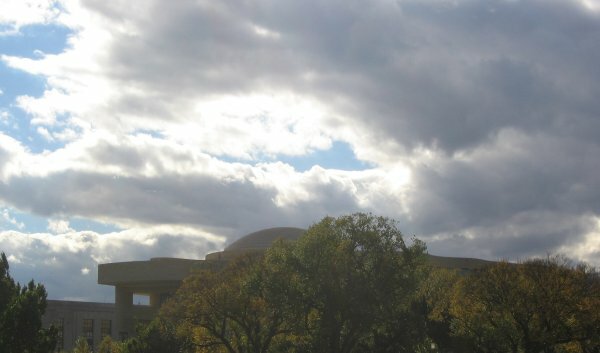 I stopped by the National Museum of the American Indian to see what was in the garden. 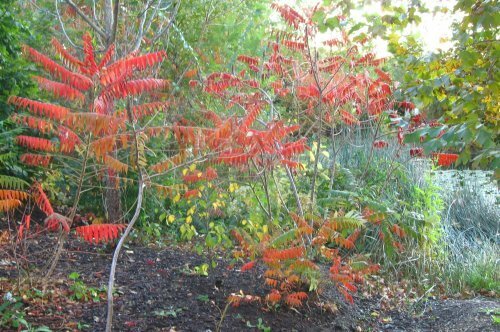 Sumacs (pictured below) are blazing red right now. In addition to the usual white-throated sparrows around the pond, there was at least one lingering red-winged blackbird. Over in the squash garden on Independence Avenue, a common yellowthroat caught my eye. As I stopped to look at that bird, a winter wren popped out of the foliage! Not bad for downtown D.C.
Fall colors come slowly to DC. 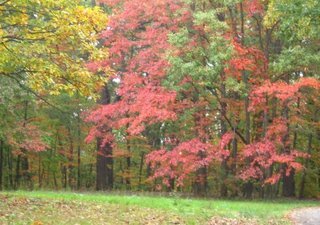 While I read reports of beautiful foliage in New England or the Blue Ridge, fall foliage takes longer to materialize in the places that I usually visit. 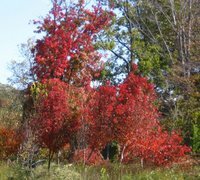 There are a few exceptions, such as dogwoods and tulip poplars. 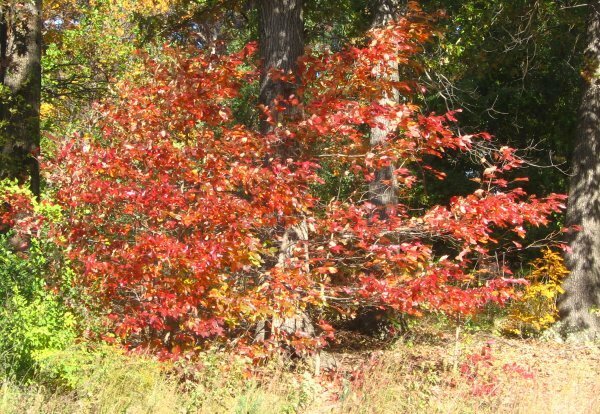 During my autumn walks in the Arboretum I have come to appreciate the beauty of tupelo trees. 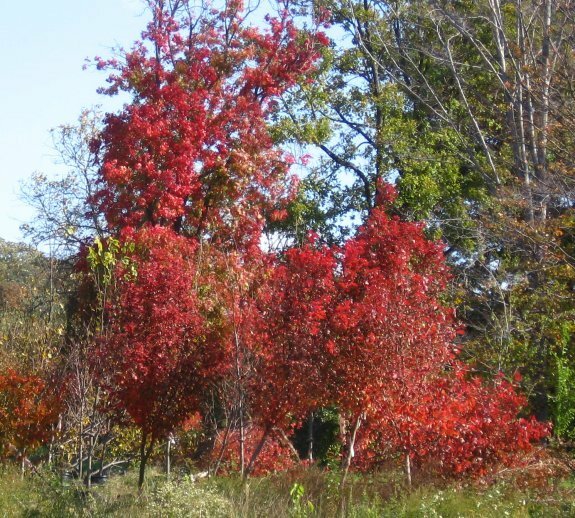 While other trees are still green, the tupelos at the Arboretum have already turned mostly red. 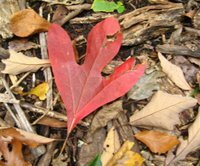 If last year is any indication, I can look forward to seeing their brilliant red foliage for the next couple weeks, as they seem to hold their colorful leaves after turning. 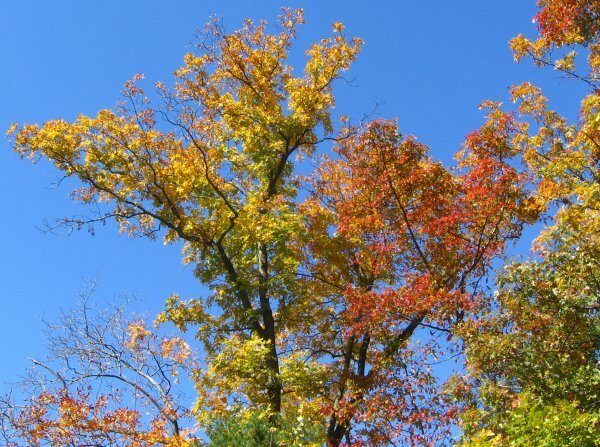 However you wish to call this species, the trees themselves are unmistakable. Several invidual trees at the Arboretum stand out from the rest for their massive size and bright red color. In the past I have felt that their color looked almost artificial from a distance. 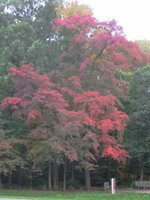 Two trees in particular stand out: one near the entrance to the Azalea Garden, and another at the top of the same hill. Both have majestic height and shade cover that is emphasized by their green surroundings. I look forward to seeing more of these tupelos in the coming weeks. All photographs by the author. Crossposted at Blue Ridge Gazette. 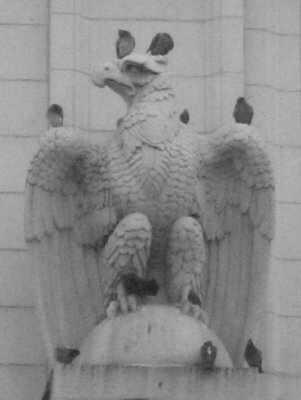 These pigeons are not showing much regard for the eagle they are perched upon. As I walked through my usual route at the National Arboretum this morning, I had the sense that winter patterns are settling in. 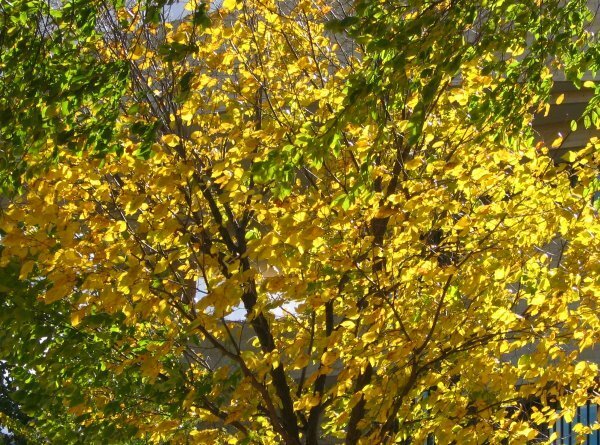 It has become noticeably colder in the last two weeks, and some trees are starting to turn. 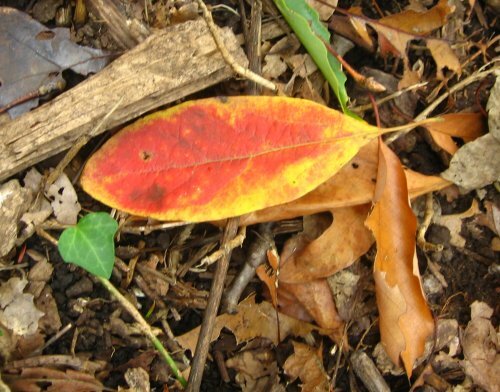 It is not peak yet by any means, but at least a few species are bright colors. While some neotropical migrants are still moving through, winter birds are taking over in greater numbers. Compared to the activity at the entrance to the garden, the rest of the hill was fairly quiet. 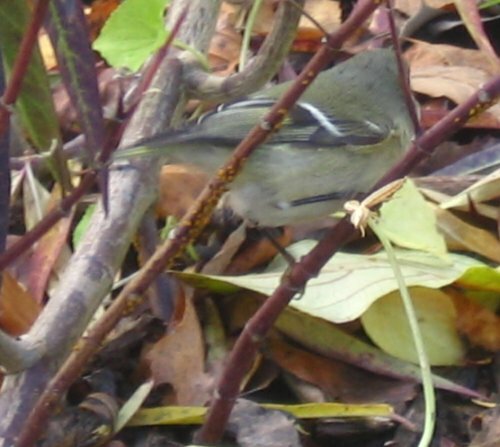 I spotted a few ruby-crowned kinglets. Many more white-throated sparrows were busy in the underbrush, along with a song sparrow and numerous eastern towhees. Several small flocks of tufted titmice were chattering from the treetops all around the hill. Up at the top of the hill, I glimpsed what I thought was a falcon of some sort, but I could not get a good angle on it. 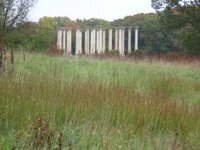 I combed through the meadows around the columns in the hope of finding a meadowlark, but to no avail. There were more sparrows of various species and many blue jays. One eastern phoebe perched on top of a withered stalk and flicked its tail while glancing around. It looked almost as aggressive as a kingbird in that posture. From the bus stop, I spotted one sharp-shinned hawk to complete the day. A developer is planning to construct 4 acres of artificial marsh on the Miles River in the Eastern Shore of Maryland to allow the construction of luxury homes closer to the original shoreline. The Maryland Critical Area Commission has signed off on the deal. Ecologists argue that the artificial marsh will be inferior in species diversity to natural wetlands and that the site is not sheltered enough from winds and wave action for a manmade wetland to survive. California is evaluating solutions to save the Salton Sea. The rapid shrinkage of the inland lake has threatened important bird habitat as well as public health in the region. Charles Darwin's complete works are now online. For example, you can see the zoology illustrations from the Voyage of the Beagle. An article on the project is here. A superior court judge in Alameda County, California has dismissed lawsuits against wind farm operators in the Altamont Pass. The plaintiffs had sought to compel restitution for the several thousand raptors killed there annually and to force a plan to reduce bird deaths. In the past decade, 1,113 raptors in the United Kingdom have been attacked in the form of gunshot wounds, poison, or nest removal. Illegal persection has hampered the recovery of hen harriers, golden eagles, and red kites. Thousands of lesser flamingos in East Africa have died due to an undetermined disease outbreak. The lesser flamingo population is under threat due to water piping projects. American agriculturalists are feeling pressure due to a decline in pollinators. The chief crop pollinator has been the honey bee, but mammals and birds, especially hummingbirds, play a role in crop pollination as well. If you're dying to see an ivory-billed woodpecker, you can chase some that have been spotted at the Florida Museum of Natural History in Gainesville. The only problem is that they are long-dead specimens. Finally, plastic pink flamingos are facing extinction because the company that makes them has ended production. The eastern meadowlark in the Arboretum was a really nice find. I have not seen one there yet myself. Thanks, Dominic! In recent years, high-resolution imagery has become more readily available to the general public. Some web services, such as Google Maps and Google Earth, make use of the satellite images. 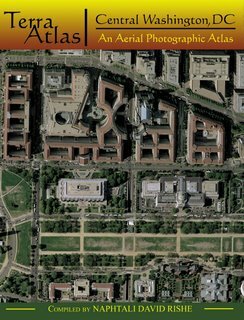 High-resolution aerial photographs from the Washington area have been incorporated into a new book, TerraAtlas: Central Washington, DC by Naphtali David Rishe. This TerraAtlas covers most of Washington, DC, and a portion of Arlington, Virginia. 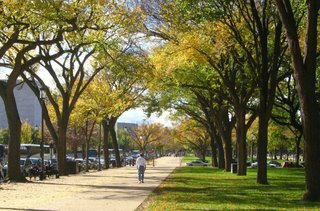 It runs from about 40th Street, NW, east to 21st Street, NE/SE; its northern and southern boundaries are defined by approximately Randolph Street, NW/NE, and U Street, SW. 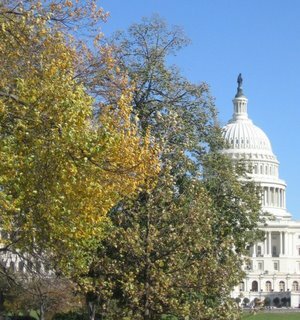 These boundaries include the downtown and Mall, Georgetown and the National Cathedral, the Pentagon and Arlington National Cemetery, Capitol Hill, and Howard and Catholic Universities. The National War College at Fort McNair does not quite make it, nor does the stadium complex. Most of the area east of the Anacostia is left out, as is upper Northwest and Rock Creek Park above Peirce Mill. Streets and landmarks are labelled, making the book a hybrid between traditional street maps and collections of aerial photographs. Images are scaled so that 1 inch equals 0.1 miles. Images for the book were taken in 2002 by USGS aircraft. Some projects appear as incomplete in the photographs. For example, the Pentagon still shows damage from 9/11, the World War II memorial is under construction, and the Giant supermarket on Rhode Island Avenue is little more than a few concrete walls. Such features date the atlas but do not seriously affect its usefulness. Several notable landmarks are obscured by fiat of the Department of Homeland Security. The mandated sites seem somewhat arbitrary. Blurred sites include the White House, Observatory Circle, the Capitol, and the Senate and House office buildings. However, the Pentagon and Supreme Court are not blurred. What purpose this serves is unclear. The White House and Capitol are two of the most photographed buildings in the country, and images of both, including from the air, are widely available. Of course, the real fun of a book like this is to study how your city looks from the air. Little details are particularly striking - trains pulling in and out of Union Station, a boat speeding down the Potomac, the shadows of trees along the shore reflected in the water. The aerial perspective gives a hint of how birds see the city, and why certain areas are so good for birdwatching. 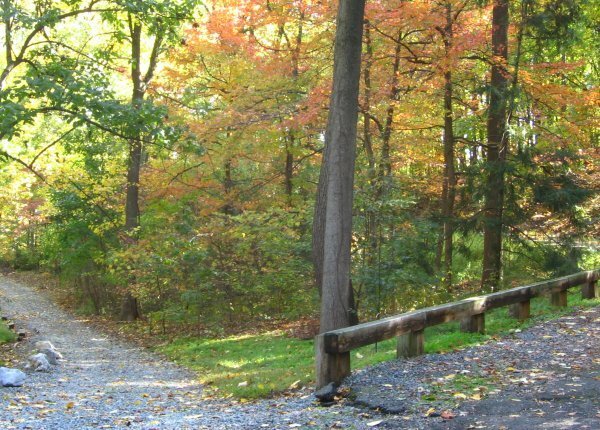 The southern part of Rock Creek Park appears as a solid mass of trees in between equally solid masses of concrete. 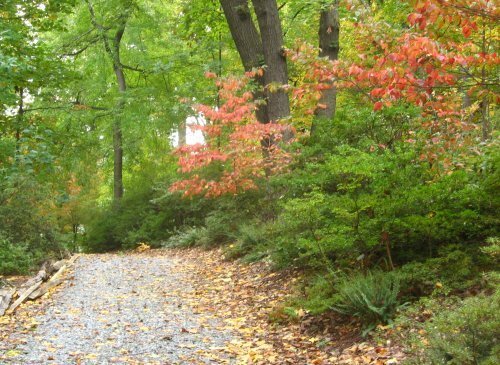 With Roosevelt Island, the contrast between the park and its surroundings is even more vivid. 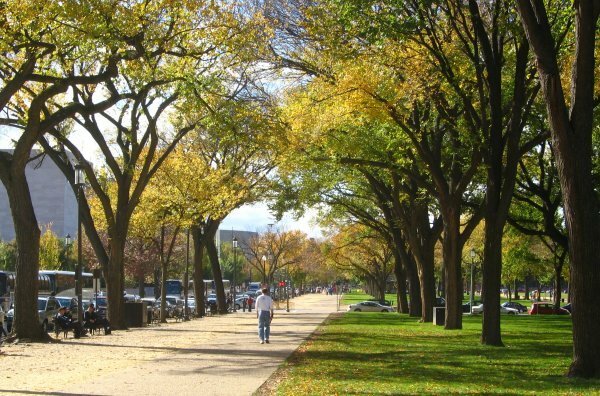 TerraAtlas: Central Washington, DC is well-suited for local residents who want to learn more about topography of the city where they live and work, and for vistors from out of town who have an interest in the Washington landscape. Note: The original text of the review erred in stating that the images were taken by satellites; the images were taken by USGS aircraft. Naphtali David Rishe, compiler, TerraAtlas: Central Washington, DC. Blacksburg, Virginia: McDonald and Woodward Publishing Company, 2006. Pp. 48; color photographs and index. On Saturday's trip to Point Lookout, some of the bald eagles we observed were calling in flight. In the media of television and films, it is common to substitute the call of the red-tailed hawk for the call of the bald eagle. The call of the red-tailed hawk conveys a mix of power and wildness that producers value highly. However, the call of the bald eagle is wild in its own way. The video below has an extended recording of a real bald eagle calling. The MD/DC Records Committee, a branch of the Maryland Ornithological Society that keeps the official bird lists for Maryland and DC, has recently updated its lists. A new species, the Dusky Flycatcher, has been added to the DC list based on a written report from Rock Creek Park in 2003. The addition brings the District's total up to 326. The chronology of birds added to the list can be found here, and recent review decisions can be found here. This Sunday's New York Times Magazine has an article on approaches to controlling feral rock pigeons and the bitter battles they generate. The article is interesting because it highlights some of the conflicting impulses that inspire and frustrate attempts at animal control, especially when it comes to birds. As we all know, feral pigeons disgust many humans by leaving large amounts of excrement on buildings, sidewalks, and cars, and by sustaining large populations. So cities and towns spend large sums to clean the fouled surfaces and invent new ways of keeping the pigeons away. Unfortunately for the towns, pigeons are not easily suppressed. Spikes and grease simply make the pigeons move from one spot to another, and many people oppose lethal control. At the same time, breeding populations of pigeons are sustained by people who feed large numbers of pigeons with bread crumbs and seed. One group called PiCAS has proposed using dovecotes to lure pigeons to specific locations in city parks and then persuading feeders to feed birds only at those locations. Meanwhile, the eggs of the pigeons would be replaced with dummy eggs to prevent the population from growing. The claim is that such a program resulted in the halving of the pigeon population in Basel, Switzerland. As a result, this group has been trying to inspire similar dovecote programs in American and British cities. The program is advertised as a humane way to reduce the pigeon population. As it turns out, the project PiCAS cites as evidence relied heavily on a form of psychological pressure. (Even the cited paper makes this clear.) Basel initiated a widespread campaign to make feeding pigeons socially unacceptable. Individual citizens harrassed feeders as they went about their routines, so that many pigeon feeders stopped feeding completely. In the end, the reduced availability of food is what reduced the pigeon population - not the egg control or the dovecotes. 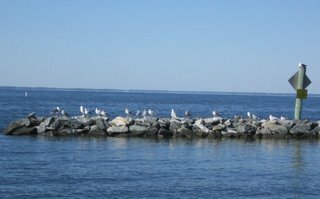 Today I attended a field trip with my local Audubon chapter to Point Lookout State Park in Maryland. 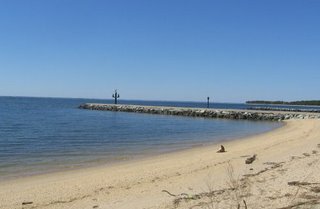 Point Lookout is a peninsula at the confluence of the Potomac River and Chesapeake Bay. The very tip of the peninsula is occupied by a Coast Guard station; thus it is off-limits to the general public. However, just north of the station is a park with picnic groves and mixed deciduous-coniferous forest, including several large stands of loblolly pine. The park includes the site of a Civil War fort and prison camp, shown below. The peninsula acts as a funnel so that southbound migrants gather in the park before heading across the bay. Thursday's cold front did not bring many migrants, unfortunately. However, the passing front left behind a cold, crisp autumn day. The sun was bright, the sky was deep blue, and the humidity was low, so that visibility extended far out on either side of the peninsula. We were treated to two species in large numbers - bald eagles and brown pelicans. We first saw a group of one adult and two juveniles all flying together at close range. Later at least eight bald eagles were kettling together off in the distance, some almost at the limit of sight. Likewise, we started out seeing one brown pelican sitting on a piling. Then about ten more flew past, and then another dozen at very close range - maybe about ten yards away. 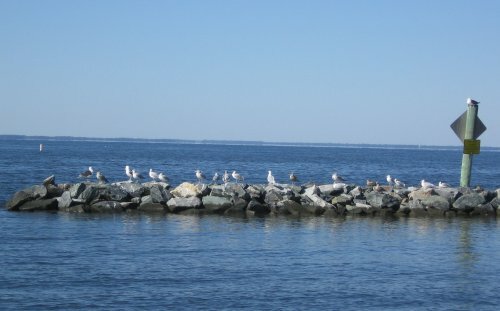 At the north end of the park, another dozen or so were perched on a breakwater. There were also lots of yellow-rumped warblers, ruby-crowned and golden-crowned kinglets, brown creepers, and white-throated sparrows. Raptor flyovers included a merlin and a northern harrier. A full report will eventually be available on the DC Audubon website, so I will leave my blog description at that. Some pictures are available at the DC Audubon site now, and more will appear later. Below is my personal trip list. Each fall I keep track of when I see my last chimney swift of the year. The disappearance of this species is a good sign of the changeover from summer to winter species in this region. Last year my last swift sighting was on October 30. Tonight I saw three in my neighborhood. It would not surprise me if my last sighting is earlier this year than last year, because the local migration roost seems to have been abandoned. I do not know whether this is because the swifts that used to gather there found a better spot, or because the chimney was capped. See here for more thoughts on swifts. Chicago now has a downtown bird hospital during the migration seasons to treat birds that strike skyscrapers. Birds are checked for broken bones, treated with anti-inflammatory drugs, and allowed to rest before release. More information about the group running the hospital is available here. Researchers are using Clark's nutcrackers to study memory. Nutcrackers store tens of thousands of nuts in various locations, but somehow remember each spot so that they can recover and eat the nuts during the winter. The research is focusing on the role played by spatial memory. A Canada goose in Kentucky still lives despite being shot with an arrow, and was sent to a rehabilitation center with the arrow still lodged in its body. Apparently the shooting occurred outside of hunting season. 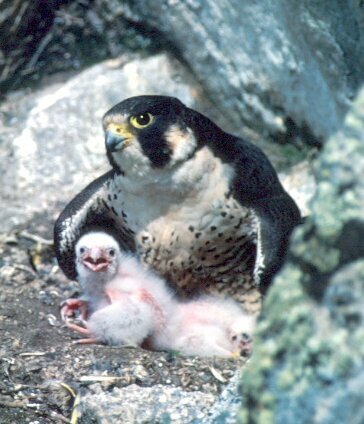 Peregrine falcons have continued to recover. There are now about 3,000 breeding pairs in North America, up from 1,800 in 1999 when the species was removed from the endangered species list, and ten times the population in 1970. The recovery has been aided by the banning of DDT, captive breeding programs, and the use of artificial nesting structures. Like the bald eagle, the peregrine falcon has been a model for a successful recovery program. Perry Lakes Park in Alabama now has a 100-foot birding tower that allows close-up views of the different strata of the forest. It will be interesting to see if other parks follow suit. About 3,500 acres of the Buenos Aires NWR in Arizona have been closed due to immigration skirmishes. The nearby Organ Pipe National Monument has suffered similar closures. A Spanish-language guide to the birds of South America is now available. The guide only includes non-passerines, but covers the whole of South America. You can order it here. The winter home of the northern bald ibis, one of the rarest birds in the world, has been found in Ethiopia. It is hoped that the discovery will lead to better conservation. President Bush stopped at the Renewable Fuels Conference in St. Louis and gave a speech on energy policy. He now finally admits that the United States has too great of a dependence on oil and that developing new sources - foreign or domestic - will not be enough to solve the problem. He argued that Americans have been too complacent about developing renewable energy sources; in reality his own administration has repeatedly rejected proposals to develop alternative energy sources and conserve nonrenewable fuels. It looks like he is finally coming around to proposing some ideas himself. Bush trumpeted solutions to future U.S. energy needs that included "solar roofs that will enable the American family to be able to generate their own electricity" and hybrid cars that will run the first 40 miles on electricity and won't "look like a golf cart." We do have hybrids, and while they may not get that kind of mileage, they certainly do not look like golf carts. "I believe wind power has got the opportunity to help," Bush said. "All we need is to put a couple of windmills right there in Washington, D.C., and we'll be less dependent on foreign sources of energy," he said to laughter from the audience. Or put one in front of his speaking podium. Bush promoted continued use of tax credits to encourage alternative energy sources, increased drilling for oil and natural gas in the Gulf of Mexico and expansion of nuclear power generation. "Nuclear power is renewable, and there are no greenhouse gases associated with nuclear power," he said. "One of the problems we've had is that nobody wants to build any plants. They're afraid of the cost of regulation and the litigious nature that surrounds the construction of nuclear power plants." Surrounded by "litigious nature"? Class-action suits by squirrels? Seriously, though, nuclear power does have questions about its long-term safety and the transport and disposal of radioactive waste. Local resistance to building new reactors is understandable, and deregulation is not the answer. At the end of the speech, Bush told his audience he had to leave to "get my limousine filled up by hydrogen." Actually he probably arrived there and departed for Chicago aboard Air Force One. Air travel uses more fuel and causes more greenhouse gas pollution per passenger than any other common form of transport. I would much prefer to hear the president making a speech like the one above than some of the other things his administration has been pushing. Unfortunately, Bush still has ground to make up before he and his administration become credible on energy policy. For example, are they renouncing the efforts to drill in Arctic NWR? Does he pledge to regulate emissions from coal-fired plants to a healthy level? What about car and truck fuel mileage - will these standards be raised? His energy policies have done more than good in the short term. Go to Tortoise Trail to read this week's I and the Bird. Unfortunately I forgot that the deadline was this week, so none of my posts are included. But go there anyway because a lot of other great bird bloggers are represented. As I noted in my post on Saturday, I never get tired of watching black-throated blue warblers. They are a bit easier to watch than other warblers. Black-throated blues tend to stay in middle-level foliage: the tops of bushes and small trees like dogwoods and devil's walking stick. They keep their colorful spring plumage throughout the year, even when other warblers are at their most confusing. They are not shy and will go about their business even with a human watching at close range. Some guides refer to this quality as "confiding." As you might expect, a male black-throated blue warbler has dark blue upperparts and a black face and throat, with white undersides. Females have greenish-blue upperparts with light-colored underparts. Both sexes show a white patch on the wing at the base of the primaries. Immatures might not show this patch, but otherwise it is a good indicator for the species. In spring, the black-throated blue song is a rising buzz, sometimes transcribed as beer beer beer beeee. 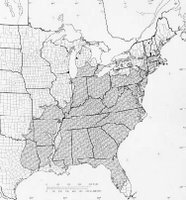 Relatively few black-throated blue warblers breed in the DC area, and those that do nest well to the west, among the ridges of the Appalachians. We only get to see them during two brief periods of the year: spring and fall migration. Luckily, their fall migration is sometimes quite protracted. In DC, they may be seen from mid-August through mid-November. Last year, my last sighting was on November 6; the Maryland Yellowbook gives November 16 as the late migration date. Even though most warblers are already gone, there still may be a chance to see a few black-throated blues before the winter. As I noted in a post a few days ago, the birdiest country in the world just got birdier. Colombia has a new bird, the Yariguíes Brush-Finch (Atlapetes latinuchus yariguierum). It was found in northern Colombia, in the Yariguíes mountain range, near the reserve for wintering Cerulean Warblers. Some reports describe this as a new species, but currently the form is classed as a subspecies. The formal description of the species (with more pictures and a range map) is available here (pdf). 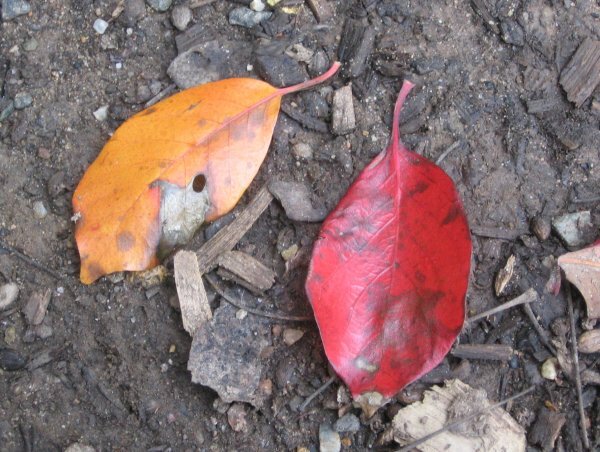 The authors indicate that the various subspecies of Atlapetes latinuchus may be split further into new species. My original post did not include an illustration, so I am adding one now. For more on birding in Colombia, see here. The U.S. Fish and Wildlife Service has required waterfowl hunters to purchase and carry duck stamps since 1934. The $15 stamps also serve as a pass into the many refuges of the National Wildlife Refuge system. Money from their sale goes directly into habitat conservation through wetland acquisition. New designs are issued each year; the design is decided at an annual contest of wildlife artists. 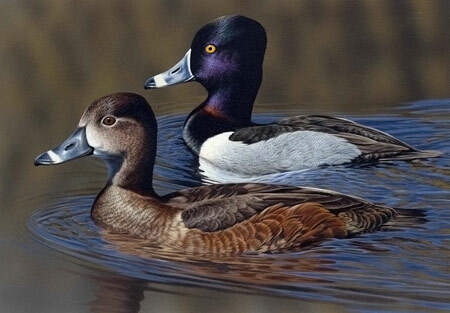 On Friday, judges at the contest in Memphis picked a painting of a ring-necked duck as the design for 2007-2008. The winning painter was Richard Clifton from Delaware. His painting beat one of flying wood ducks and another of cinnamon teal. Images of the top entries are supposed to be available on the FWS Duck Stamp page, but are not there yet. In the meantime, here is an image of the winning entry reproduced from the Ducks Unlimited article. As most birders know, the term "ring-necked duck" is a bit of a misnomer. As with several other species, the feature from which it derives its name is only visible when you examine a dead bird in your hand. (Red-bellied woodpecker is another example of this.) The white neck ring of ring-necked ducks is virtually impossible to spot through binoculars or scopes. It may be better to think of them as "ring-billed ducks" since that feature is far more prominent and diagnostic. As Nick mentioned in the comments, this post was quoted in today's Express (pdf, p. 32). My argument was not really against the USFWS; it was against whoever named the bird when it was discovered. A prestigious Ig Nobel Prize has been awarded for woodpecker research. (No, not that woodpecker research!) No, this research asks why woodpeckers do not get headaches despite banging their heads against trees. ORNITHOLOGY: Ivan R. Schwab, of the University of California Davis, and the late Philip R.A. May of the University of California Los Angeles, for exploring and explaining why woodpeckers don't get headaches. REFERENCE: "Cure for a Headache," Ivan R Schwab, British Journal of Ophthalmology, vol. 86, 2002, p. 843. REFERENCE: "Woodpeckers and Head Injury," Philip R.A. May, Joaquin M. Fuster, Paul Newman and Ada Hirschman, Lancet, vol. 307, no. 7957, February 28, 1976, pp. 454-5. REFERENCE: "Woodpeckers and Head Injury," Philip R.A. May, Joaquin M. Fuster, Paul Newman and Ada Hirschman, Lancet, vol. 307, no. 7973, June 19, 1976, pp. 1347-8. The first reference is available free here. No one seems quite sure whether the prize is a compliment or an insult. During the long, hot D.C. summers, I tend to forget just how cold 50 degrees feels when it is windy and overcast. Then one day in October I get a reminder. Today was one of those days. This week the temperature fell about thirty degrees in two days, from a high in the mid 80s on Wednesday to a daytime high in the low 50s yesterday. This morning felt even colder when I went over to the National Arboretum. Birds are starting to switch from late summer species to mid-fall species at the National Arboretum. Today I had several first-of-the-fall species, including brown creeper, yellow-bellied sapsucker, and both kinglets. 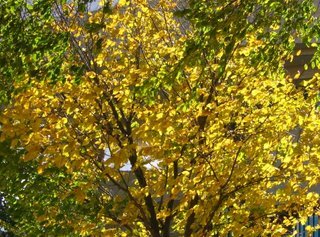 The white pines near the visitor center held a large flock of chattering golden-crowned kinglets. As usual with kinglets it was difficult to pin down the species, not because the two kinglet species have confusing field marks, but because the birds will not sit still. The one ruby-crowned kinglet I saw was on the far side of the Azalea Garden. A few warblers are still moving through. I saw at least three black-throated blue warblers (two males and a female) and a few ovenbirds. 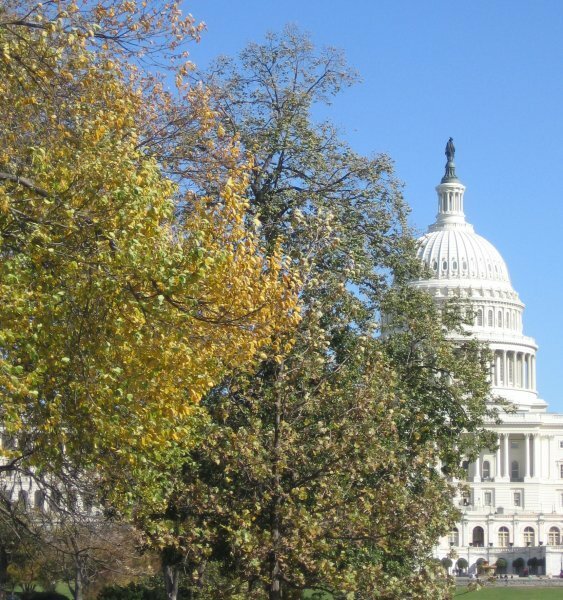 Black-throated blue warblers tend to linger around D.C. in the fall. Last year, I saw them at the Arboretum well into November, after most other species in their family were long gone. I am glad they do stick around because I never get tired of watching this species. Unlike some other warblers, black-throated blues keep their colorful summer plumage in the fall. They are also an exception in not inducing "warbler neck," as they move around in middle-level foliage. Unfortunately my time for watching warblers was cut off by the arrival of heavy rains. The initial downpour quickly lightened into a drizzle, but even that was enough to shut down most bird activity. So I wrapped up my birdwatching and left the Arboretum. By the way, BirdLife International has declared this weekend as its annual World Bird Festival. It encourages birders to go out and visit Important Bird Areas over the next two days. The U.S. Botanical Gardens, located on the west side of the U.S. Capitol, recently constructed a new three-acre garden. 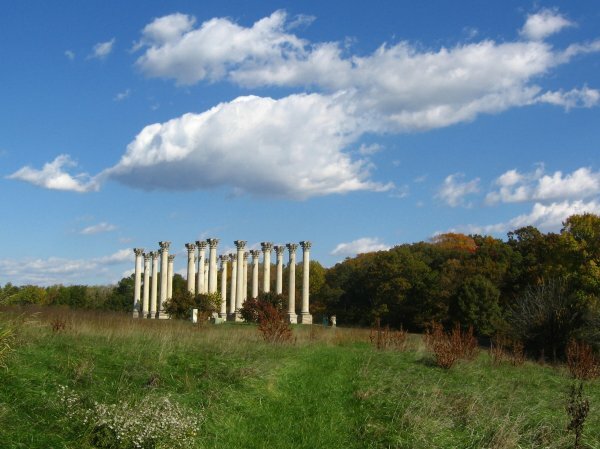 The National Garden opened to the public this past Sunday, October 1. It consists of several interlinked parts: an open lawn, a butterfly garden, a rose garden, and a garden of regional plants placed around a meandering stream. A fountain and amphitheater round out the garden. Right now, the gardens do not look like much because the plants are still very young. But I expect that in a year or two the beds will be bristling with flowers. 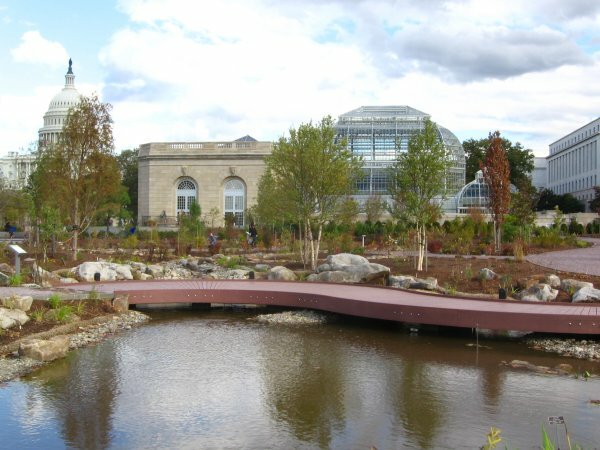 Unfortunately, the gardens are surrounded by a gated fence, and the access hours for the National Garden appear to match those of the Conservatory. So Bartholdi Park may still be the USBG's only option for an evening walk. Of course, as a birder I want to know what the birding possibilities for the new gardens will be. 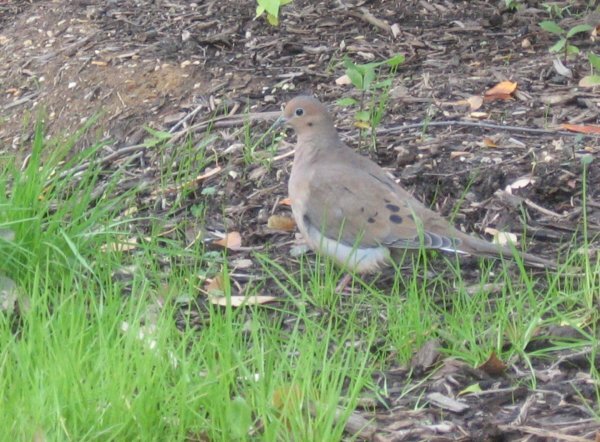 The shrub cover is not quite dense enough to attract many species, and the downtown location makes bird diversity unlikely. Still, this evening I spotted a few species, including mourning doves, a song sparrow, and my first white-throated sparrow of the fall. Best of all was a flock of palm warblers - more than 10 - all twitching and pumping their tails as they foraged on the ground. There may have been a common yellowthroat and yellow-rumped warbler in the mix as well. That is pretty good for downtown D.C. 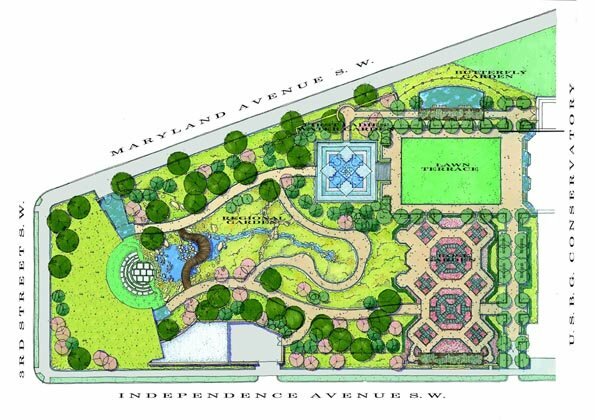 The east end of the National Mall now has a belt of gardens, running from Bartoldi Park on the south side of Independence Avenue, through the new National Garden, to the garden of the National Museum of the American Indian. None of this is prime habitat, but all three spots ought to attract some migrants in spring and fall. It makes another option for walking and casual bird watching. This was a slow posting week, but there should be more next week. News and links about birds, birding, and the environment, plus a few other things. Ultralight aircraft are leading 18 endangered whooping cranes on their southbound journey from their breeding grounds in Wisconsin to their wintering grounds in Florida. The population restoration program uses aircraft to train captive-bred cranes to migrate south for the winter; in the spring the cranes will know where to go without assistance. Little egrets, a southern species, are now breeding in London for the first time. The species was hunted nearly to extinction in the 19th century. Just as the hunting of great and snowy egrets in North America led to the formation of the National Audubon Society, the near extinction of little egrets prompted the foundation of the Royal Society for the Protection of Birds in Britain. Here is a profile of the fox sparrow, one of my favorite species. This week Congress renewed the Neotropical Migratory Bird Conservation Act, which provides grants for bird conservation projects. When a rare rose-coloured starling appeared in England and then died, neighbors and news reports blamed birders who had come to see the species. The RSPB attributes the bird's death to two large ticks that were lodged into the starling's head. Yet another new bird species has been found in Colombia: the Yariguies Brush-Finch (Atlapetes latinuchus yariguierum). 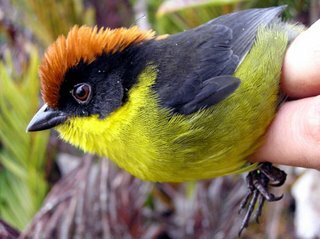 Update: The brush-finch was discovered in the Serranía de los Yariguíes, a mountain range in northern Colombia northeast of Bogota. See ProAves for more information. 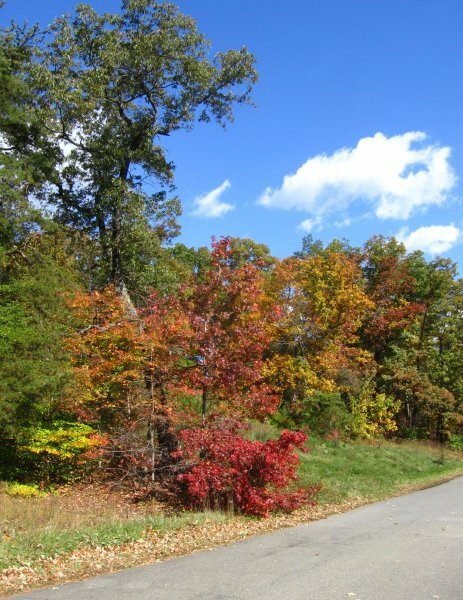 The site is near the Cerulean Warbler reserve. 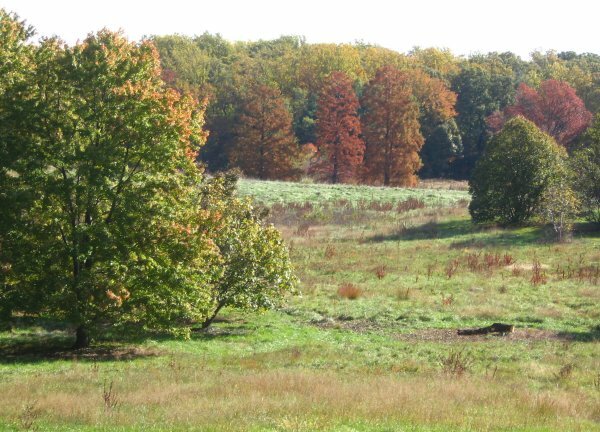 In upstate New York, former agricultural land is being reverted to wetlands in the federal and state refuge systems. Judges in western jurisdictions have been expressing frustration with the Bush administration over non-enforcement or reinterpretation of many statutes dealing with wildlife and land conservation. Check out Laura Erickson's coverage of the North American Ornithological Conference at Birderblog, including coverage of presentations related to ivory-billed woodpeckers here, here, and here. Attending the same conference, Nuthatch has a report on the River of Raptors hawk watch. Stop by and say hi to Cindy of Woodsong, who has been dealing with a major illness. Also, Shakespeare's Sister celebrated its second blogiversary yesterday. And, as always, the Friday Ark is boarding. The Maryland state Critical Area Commission has blocked the development of 313 acres of the proposed development near Blackwater National Wildlife Refuge in Cambridge, Maryland. The project would have built 2,700 homes, a convention center, retail complex, and a golf course on 1,080 acres of land adjacent to the Little Blackwater River. This river flows through the National Wildlife Refuge and eventually empties into the Chesapeake Bay. Runoff from the site could affect the resources of both. The 313 acres blocked by the commission would have held the golf course and retail complex. The developer could still build on the rest of the land, but any revised project would need to go through the local approval process again. A five-member panel from the Critical Area Commission held hearings on the project and made a recommendation to the full commission. You can read the report here (pdf). The report sets forth the panel's concerns point-by-point and advises rejection. The main objections stem from a lack of data to support the developer's claims regarding impact on pollution, and noncompliance with watershed regulations. The commission's hearings were attended by over 100 people, and the commission received over 4,000 emails on the subject. Most responders opposed the project.